Star striker Oli McBurnie has leapt to the defence of under-fire Barnsley boss Jose Morais. The relegation-threatened Reds could exit the Championship today if battling if they don’t beat play-off-chasing Brentford this afternoon and Bolton Wanderers beat Burton Albion. Scottish international McBurnie has done his best for the Reds cause, scoring eight goals in 15 games since joining on loan from Swansea City in January. 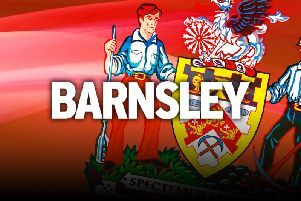 But just two wins in 13 games under Morais’ rocky stewardship has left Barnsley languishing third from bottom. “The manager can’t take all of the responsibility,” stressed McBurnie. “As players, we’ve got to look at ourselves at the end of the day. The manager’s not going on to the pitch for us. “Naturally, the manager comes in for a lot of criticism when things aren’t going well, but we’ve got to own up to it as players. McBurnie is confident he is going to leave Barnsley when his loan expires at the end of the season exactly where he found them - in the second tier. The marksman is wanted by Leeds United, Derby County and Sheffield Wednesday. His contract at Swansea is up in the summer and Barnsley would be unable to compete with those big spenders, especially if they go down. McBurnie said: “We will 100 per cent stay up. There is no other answer anybody in our dressing room with give. It’s the only thing that matters now. “Whether it’s by hook or by crook, and it might not even be pretty, it’s all about getting points on the board and keeping this club where they belong. “I am still fully focused on helping the boys stay up. “We’re going to give it our all, run ourselves into the ground and hopefully survive. “If I don’t score another goal this season and we stay up, then it’s job done. “We’re at the stage where it’s by any means possible now.